Brett Singer and Woody Delp are internationally recognized experts in the field of indoor air quality. Singer is a Principal Investigator and Staff Scientist; Delp is a Research Engineer in the Indoor Environment Group and the Whole Building Systems Department of the Energy Technologies Area, Berkeley Lab. 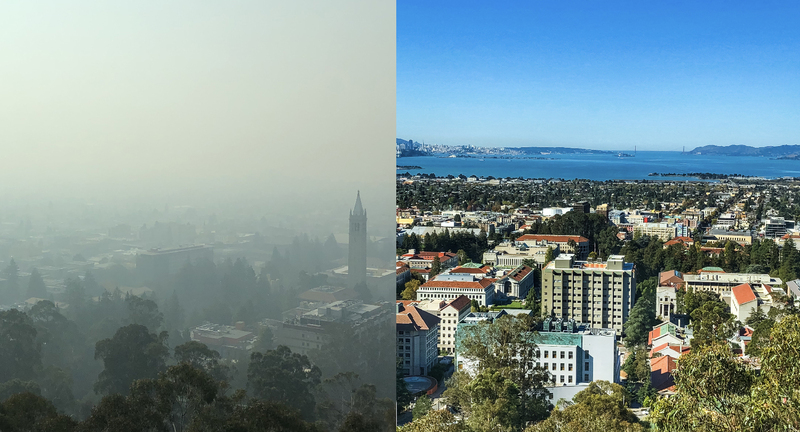 Singer and Delp have conceived, conducted, and led research projects related to air pollutant emissions, physical-chemical processes, and pollutant exposures in both outdoor and indoor environments. Their research aims to understand the real world processes and systems that affect air pollutant exposures. One of the goals of their work is to inform the design, construction, and operation of high-performance buildings for public benefit. Many recently constructed homes and some that have undergone extensive retrofits have a mechanical ventilation system to ensure they get enough outside air under normal conditions. (In California the most common system is an exhaust fan in the laundry room that is designed for continuous operation. Elsewhere the systems may bring in outdoor air through the forced air system, with a control on the thermostat or “Air Cycler” unit.) In most cases, mechanical ventilation should be turned off during severe outdoor air pollution events. The exception is a system with a high efficiency filter. If you live in an ultra-tight home, such as a Passive House, you should not turn off your ventilation system. Instead, you should rely on filtration. See below for guidance on filter selection. Also, remember to turn your ventilation system on again when the smoke clears. Limit indoor sources during periods of poor air quality. This includes smoking, candles, incense, or strong chemicals. Frying and using your oven also emit pollutants. Modern forced air systems can be operated in “Fan” mode, in which the system moves air through the ducts and filter without heating or cooling it. If you can’t figure out how to do this, look online for help or contact the thermostat maker. In some older houses, the thermostat may have a “Fan – On” option that doesn’t actually turn the fan on. Check if this setting works by feeling if air is coming out of the supply grilles. Size it for the space. They work better in rooms that are closed from other parts of the house, such as bedrooms. If you don’t have enough devices for your entire residence, create one or more clean air zones within your home. The Association for Home Appliance Manufacturers (AHAM) provides a list of air cleaners with verified clean air delivery rates (CADR. AHAM recommends selecting a unit with a CADR that is at least two-thirds of the floor area of the room; so for a room that is 120 square feet, you should have a CADR of at least 80. If the room is open, a higher CADR is needed. Caution: don’t rely on the “auto” setting. These have low-cost particle sensors that are often not accurate. Operate on highest speed that you can tolerate. Yes, using a 20-inch box fan and 20-inch square filters. Instructions are here. These will work better with deeper, 4-inch or 5-inch filters, which can be purchased online. One-inch filters that are available at hardware stores will also work. Select a filter in the “Best” category in the table above. The 1-inch deep filters typically have higher resistance and provide a lower delivery rate of clean air; so they work better with a more powerful fan. The filter may need to be replaced as frequently as every few days when smoke levels are in the unhealthy zone. If it starts smelling like smoke, change it. Q. What about when I’m in my car?